If you have been following the saga of the Team America BNR32 you know it has been in hiatus for quite a while. 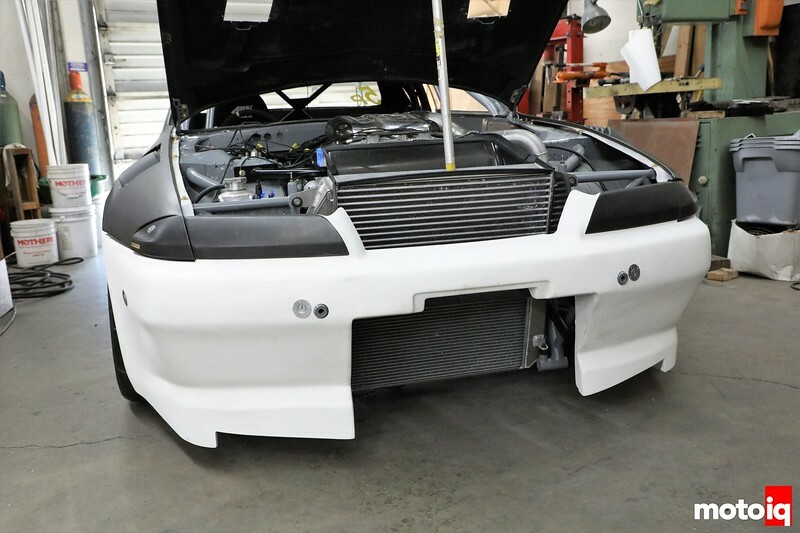 Brian Kono of Afterhours Automotive has been straightening out a lot of the unfinished details on the car and basically finishing its construction. Now the car is back on its wheels and it is ready to go over to its top secret garage. Where a new mil-spec wire harness will be constructed and a MoTec M1 fitted so the car can finally be tuned. Once the car is up and running, with the electronics sorted out, it will go back to Afterhours to finish sorting out the steering system and finish the fabrication of the aero. A big part of the work Brian did was to build the support structure for the front splitter which was covered in our last article. Brian also hung the front bumper and made it so it could be quickly removed for transport. Since the splitter can generate over a thousand pounds of force, the front structure of the car had to be substantially strengthened. The downforce the splitter generates is supported by this chromoly tubular support that ties into the shock towers and ultimately the cage. The structure also supports the front heat exchangers. Previously, spindly aluminum tubes were used which failed almost immediately. This caused the splitter to drag on the ground instead of creating downforce. 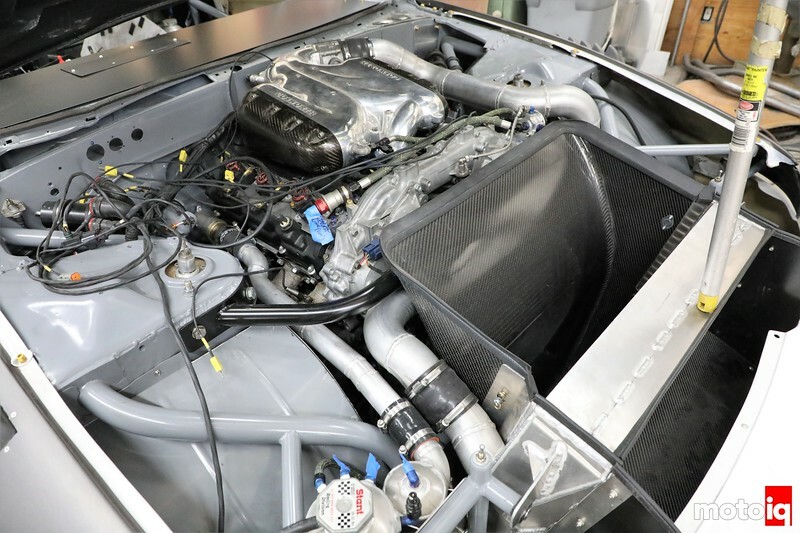 The intercooler has been switched from a cowl mounted part to a larger conventional front mount placed on top of the radiator in a large carbon fiber sealed duct. 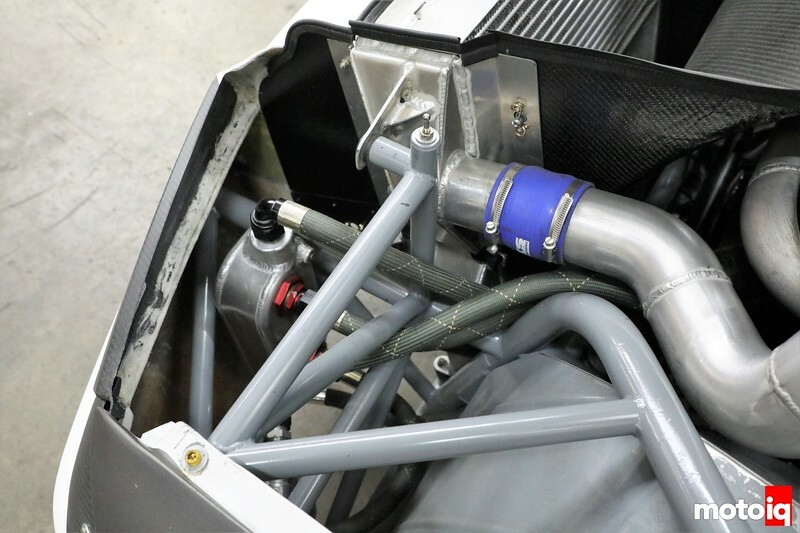 New intercooler charge piping was fabricated from the mid-mounted in cabin turbo to the intercooler. In the duct the flow is divided between the radiator and the intercooler with a splitter. Here is how the charge pipes and the hard lines for the coolant are arranged on the opposite side of the engine compartment. Everything is now clean, simple and easier to work on. It is interesting that with the compact VQ engine most of the engine is now behind the center line of the front axle, making the car a front mid-engine arrangement. This, and the fact that the engine is a lot lighter than the iron blocked RB, means the R32 will have better weight distribution than the previous FWD like 60/40 weight distribution it originally had. Aero guys hate heat exchangers, because dealing with cooling airflows messes with their designs. Thus for oil cooling a Fluidyne water to oil cooler was used. This position looks to be less than ideal from a weight distribution point, but it allows for fewer bends in the plumbing and easier access for maintenance. So it was agreed that the compromise was acceptable. You can also see how the heat exchangers float on rubber mounts so chassis flex won’t cause them to develop cracks. Awesome, it lives! Always looking forwards to seeing where this puppy goes and glad to see it hasn’t been forgotten. Mmm… yes, more updates on my favorite car of all time, I was wondering when I was gonna see this beauty again! Really happy to see you’re still working away and this project hasn’t been forgotten! I’m looking forward to seeing more updates – but even more to see this car successfully back out on the track! Interested to know which drive by wire setup you used with the Tilton pedal box, also which throttle body you use too. Looks awesome, keep at it! Awesome update, is there one by chance for the 86? I’m curious what had been tried for the bearing issue. Have you used awrx scavenge pump for the heads or is the oil accumulating elsewhere? This is the project that got me to the site, glad to see some progress being made again! Damn finally we get to see this beauty again! Any plans for the coming season? It needs to see some time attacks again! It’s been too long.! Wonderful to see an update on the car’s development. Hope to see it down here in Australia for WTAC sometime in the future. Any reason you guys decided to route the downpipes/ wastegate pipes under the tunnel instead of routing them out to the passenger’s door? The original plan was to have it exit over the top of the rear diffuser but that never got done. I figured that by boxing the exhaust out of the passenger’ door you can seal up the belly of the car with flat panels…..